I can remember when my son was younger and how he loved all things with wheels. From race cars, to trains and everything in between. I couldn't go wrong buying him a present if he could push or drive it on the floor. Toy State was one of my go to brands for quite some time to find him all of the hottest wheel-bearing toys. They have an awesome array from Hot Wheels, to CAT Machines, to Thomas the Train...and MORE. I love that they have so many toys to offer for all age groups too so there's something for everyone that's on my "little people" list. Hot Wheels Stretch FX-Dieselboy: Stretch the car and watch it GO! Or pull back the car to reveal the engine with lights, music and driving sounds as the vehicle comes together and drives away. CAT Machine Maker Apprentice Multi-Machines: Fully equipped with a realistic screwdriver and the pieces to build three classic CAT machines or to create your own fantasy machines! 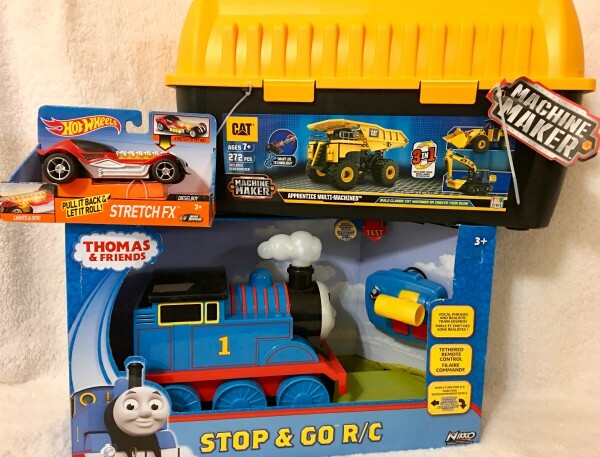 Thomas Stop & Go R/C: This R/C features train noises, Thomas phrases with just the push of a button, a realistic train conductor and more! For 30 years, Toy State has been an innovator and industry leader in the manufacture of licensed and highly stylized lights & sounds and radio controlled vehicles. Founded in 1984, Toy State’s core portfolio includes Road Rippers® and Hot Wheels® lights & sounds and radio controlled vehicles, as well as Cat® and Cat® Preschool construction toys. Working in-step with the world’s leading automakers, and Caterpillar, the leading manufacturer of construction equipment, Toy State products provide hours of enjoyment for kids of all ages.